Leading Manufacturer of glass printing machine uv, sunpack printing machine uv, uv agfa anapurna faltbed printing machine, tiles printing machine uv, foam uv printing machine and uv fabric cloth roll to roll printer from Coimbatore. Based on the skills of our adroit vendor’s professional and creative workers, we bring forth an extensive range of UV Glass Printing Machine. Owing to it’s defining features, the offered range is extensively demanded in various industries. A team of our skilled vendor’s professional, with a wide experience manufacture the offered printers using high grade raw materials and modish technology. The offered printers are available with us in various sizes, shapes, designs and other related specifications. Text as small as 6 pt. Is perfectly legible. Variadot imaging technology plus a four color ink set uses significantly less ink than six color systems; ink savings of up to 50 percent can be realized. UV inks are packaged in bulk ink bags, minimizing change-out. Being a well-established-organization, we are engaged in trading & supplying a distinguished range of UV Flatbed Sunpack Printing. Our offered printer is intricately designed under the vigilance of skilled vendor’s professional using quality tested raw materials and sophisticated technology in line with the international quality standards. Clients can avail this printer in various designs, shapes, and sizes at market leading price within the given period of time. Based on the skills of our adroit vendor’s professional and creative workers, we bring forth an extensive range of UV AGFA Anapurna Flatbed Printing Machine. 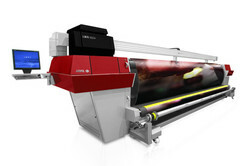 Anapurna is a high-speed inkjet system suitable for 156 cm wide prints for graphic screen printers and sign shops. 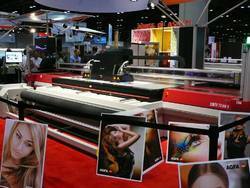 Owing to its well-defined features, the offered inkjet system is extensively demanded in the market. A team of our adept vendor’s professional with hard-earned experience manufactures the offered system using high-grade raw materials and the latest technology. 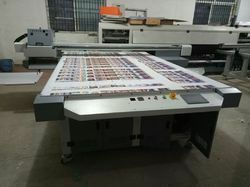 Our firm specializes in offering an excellent range of UV Flatbed Tiles Printer. To maintain industry defined quality standards, this printer is manufactured using quality proven raw materials and cutting-edge technology. Also, this printer is examined properly by our quality controllers upon distinct parameters of quality. Our firm specializes in offering an excellent range Foam UV Printing Machine. This innovative printing machine is widely demanded in various industries for meeting diverse applications. Annapurna is a high-speed inkjet system suitable for 205 cm wide prints for graphic screen printers, photo shops, and sign shops. To maintain industry defined quality standards, this printing machine is manufactured using quality proven raw materials and cutting-edge technology. Also, this machine is examined properly by our quality controllers upon distinct parameters of quality. Based on the skills of our adroit vendor’s professional and creative workers, we bring forth an extensive range of UV Fabric Cloth Roll To Roll Printer. Owing to its defined features, the offered printer is extensively demanded in various industries. A team of our skilled vendor’s professional, with a wide experience manufacture the offered roll printer using high-grade raw materials and modish technology. The offered product is available with us in various sizes, shapes, designs and other related specifications. 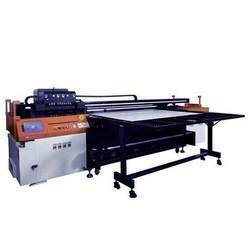 Looking for UV Printing machine ?